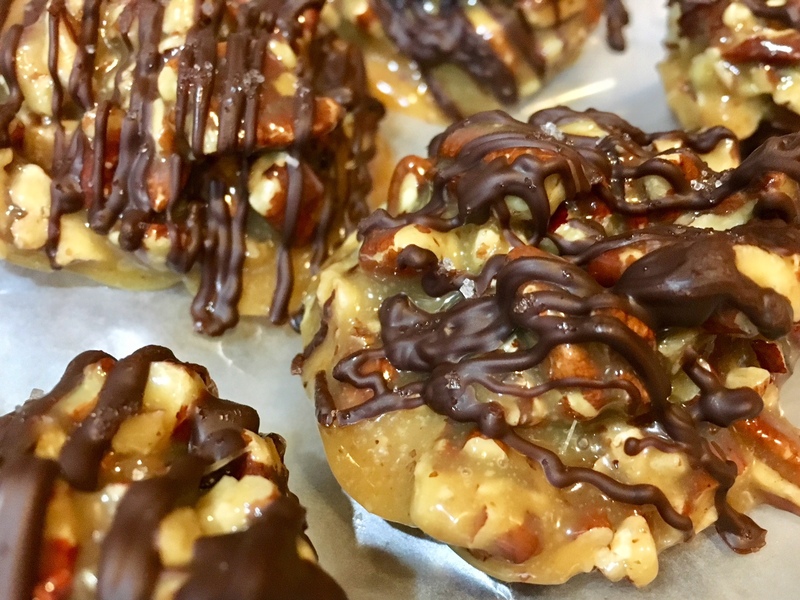 Pecan Caramel Clusters don’t require any baking. Quick and easy, these treats would be a perfect addition to Mother’s or Father’s Day brunch. You can also substitute in your favorite nut mix. A coworker has asked me to try making these with a pecan, cashew and pistachio combination. Sounds even better, can’t wait to give it a spin. Break pecan halves into slightly smaller pieces, leaving big chunks. Put in a large bowl. Dump heavy cream and unwrapped caramels into a small sauce pan. Heat over medium low until everything melts, stirring gently to combine. Don’t be tempted to heat caramel too quickly, it can burn (I know from firsthand experience). When caramel and cream have melted together, remove from heat. Add vanilla and 1/4 t sea salt and mix completely. Pour melted caramel over pecan pieces and use a spatula to stir until evenly coated. Use a tablespoon to scoop out clumps, setting on prepared baking sheet. Allow to cool, about 30 minutes. When pecan clusters have set, transfer chocolate chips into a plastic bag. Microwave in 15 second bursts until chocolate melts. 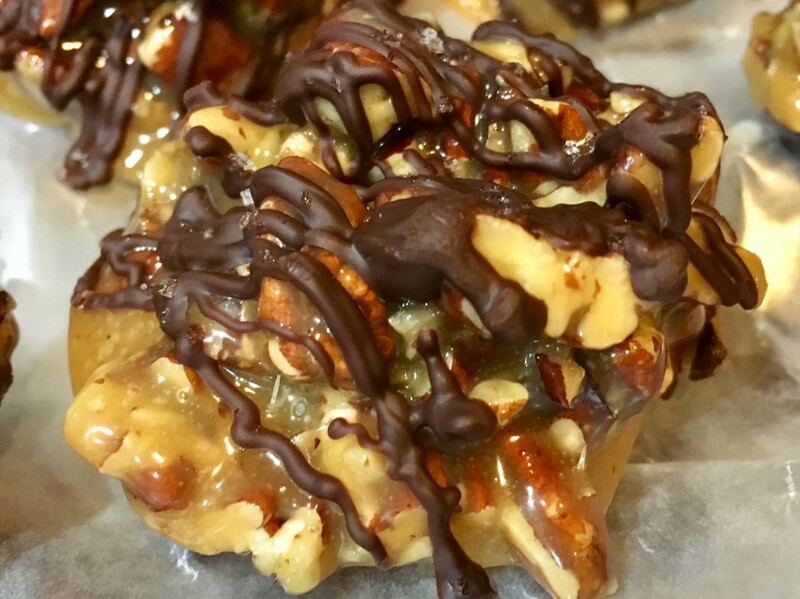 Snip the corner and drizzle pecan clusters. Sprinkle with sea salt if using. Store refrigerated. Put parchment paper between layers if stacking, these get a bit sticky at room temperature.